'Albion' is ever-bearing, producing fruit all summer long and into fall. This berry has outstanding flavour and because it does not produce many runners it is excellent in containers. Must have! Albion is an everbearing variety meaning it produces its first crop around the last week of May and peaking again throughout the summer with the last crop arriving in mid-September. Albion is resistant to verticillium wilt and crown rot. 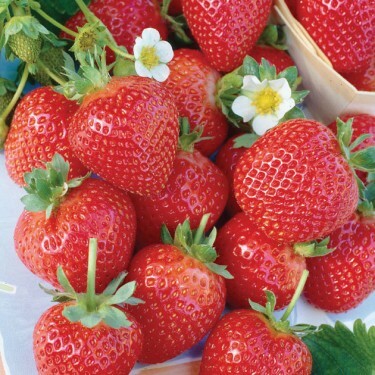 It was bred by the University of California, where they assess 12,000 potential new varieties every year - and discard almost all of them.Albion the latest in a succession of excellent varieties and is already the most widely grown strawberry in California. One tip: you can increase the yield by 25% by nipping off all the runners. Watch the Botanus Garden Club video about Strawberries including 'Albion'!